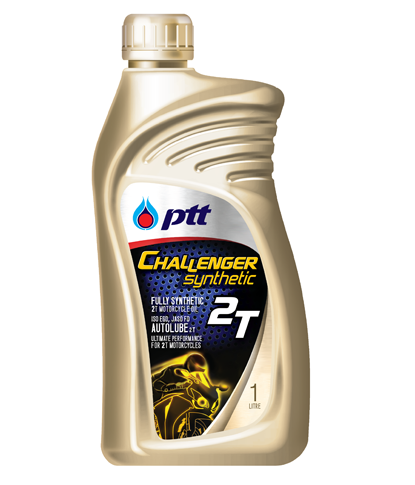 [CHALLENGER SYNTHETIC 2T] น้ำมันเครื่องสังเคราะห์ 100% คุณภาพสูงสุด เหมาะสำหรับรถจักรยานยนต์ 2 จังหวะสมรรถนะสูง รุ่นใหม่ ประเภทสปอร์ต, บิ๊กไบค์ และชอปเปอร์ Premium fully synthetic 2-stroke engine oil. Formulated for ultimate performance of modern 2-stroke motorcycles such as big bikes and choppers. • Designed for high performance air and water-cooled of modern 2-stroke motorcycles such as sports types and motorcross. • Recommended for high performance 2-stroke engine such as paramotor, chain saw and snow mobile.